Nearly every company deploys network monitoring tools which enable the IT team to keep a constant eye on remote servers. Downtime costs money. Of course, network monitoring isn’t limited to remote servers. It can be used to manage your local network and that’s why a tool such as O&O Software’s O&O Syspectr can come in handy. You can use this tool to remotely manage PCs on your network, automatically deploy software updates, check drives for potential issues, remotely shut down and check for unauthorized access. In a surprise move, O&O Syspectr has gone completely free of charge as of today. It’s now available for all users, whether you are an enterprise customer wanting to monitor hundreds of PCs, to a home user wanting to manage their family network. Previously, companies would have to pay €1/month per networked PC or €5/month to monitor each server. If you had a few servers and a 100 PCs to monitor, the fact that Syspectr is now free, will save you thousands of Euro’s each year. You don’t need to sit in front of a computer all day keeping an eye on your network, either. Luckily Syspectr includes a number of notifications, so you can be warned if one of your PCs is in trouble or there’s attempted unauthorized access. You can then choose how to respond. Home users should consider Syspectr. It’s not just a tool for office or enterprise users. 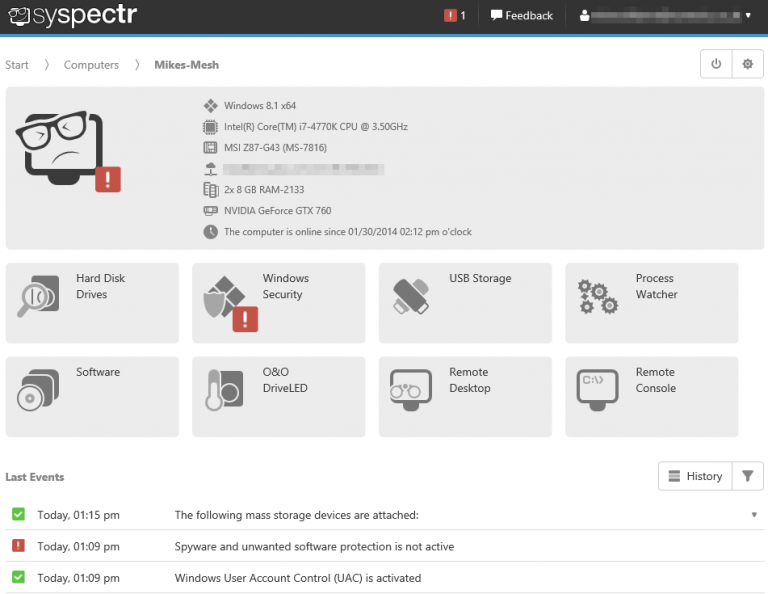 If you have more than one PC in your family home, you could deploy Syspectr to keep an eye on the other machines. Deploy updates synchronously, install new software across each PC, make sure they are secure and, of course, monitor what the user is installing themselves -- ideal if you want to make sure your children do not install rogue software. One downside is that every system has to be a Windows PC. You won’t be able to use Syspectr to monitor a Linux-based server, nor can you add a Mac to your home network and use Syspectr to deploy updates or monitor status.